While the bill approving the sale of recreational marijuana still has a way to go before being adopted, we should realize that, at some point in the not-too-distant future, recreational marijuana could very likely be available in Connecticut. — Darien Health Director David Knauf has a master’s degree in public health, a master of science degree and is a registered environmental health specialist. 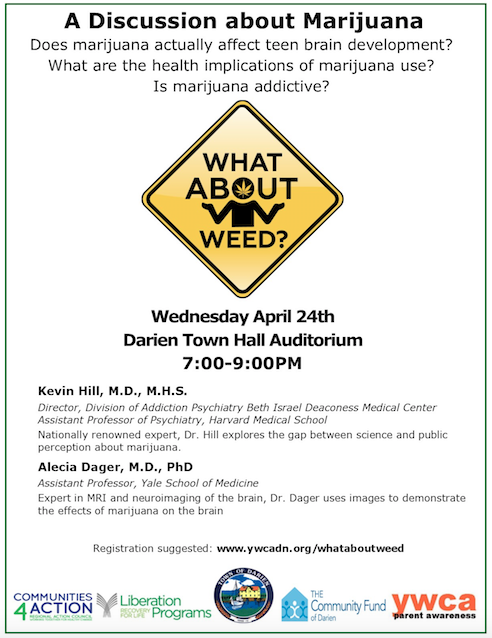 To provide residents, and in particular parents, with meaningful information on this important topic, there will be a discussion about marijuana “What About Weed?” on Wednesday, April 24 from 7 to 9 p.m. at the Darien Town Hall Auditorium. The YWCA Darien-Norwalk in partnership with Communities4Action, Community Fund of Darien, Darien Depot, Darien Health Department and Liberation Programs presents this not to be missed community event. Experts will discuss how marijuana affects teen brain development, what the long and short term health implications of marijuana use are and whether marijuana is addictive. Kevin Hill, M.D., M.H.S. director, Division of Addiction Psychiatry Beth Israel Deaconess Medical Center, assistant professor of psychiatry, Harvard Medical School. A nationally renowned expert, Dr. Hill explores the gap between science and public perception about marijuana. Alecia Dager, M.D., PhD assistant professor, Yale School of Medicine, an expert in MRI and neuroimaging of the brain, Dr. Dager uses images to demonstrate the effects of marijuana on the brain. Come to the meeting and hear experts discuss how marijuana affects teen brain development, what the long and short term health implications of marijuana use are and whether marijuana is addictive. Co-sponsors of the event include Communities4Action, Community Fund of Darien, the Darien Depot, Darien Health Department, Liberation Programs, and YWCA Parent Awareness. To meet the challenges of the times, we all need to be informed — join us on April 24! Reservations are suggested. As director of health for the Town of Darien, I am a member of the Connecticut Association of Directors of Health (CADH), a nonprofit organization comprised of the directors of Connecticut’s local health departments. Local health directors are the statutory agents of the state commissioner of public health and ensure the provision of essential public health services at the local level in Connecticut. “While recognizing the potential financial benefits to the State from taxation revenue associated with this industry, the members of CADH oppose the retail sale of marijuana. “As you are aware, Connecticut and the nation are struggling to make an impact in the opioid crisis. In 2018, over 1,000 of our residents lost their lives to overdoses. This number does not reflect the untold thousands that overdosed and survived to live with the disease of addiction. “Local health departments have aggressively worked on this issue by collaborating with law enforcement officials, pre-hospital care partners, boards of education, prevention coalitions, elected officials, members of clergy, treatment facilities and countless other disciplines to try to turn the tide in the epidemic. “While there is a debate about marijuana as a gateway drug, there is no debate that people of all ages, genders and socio-economic backgrounds are affected by the disease of addiction. Allowing the retail sale of marijuana may increase these addiction rates and amplify the current crisis. “Our residents, communities and personnel are struggling to make an impact in the opioid crisis and adding retail sale of marijuana in our state will likely complicate those efforts.